Groggle has been up all night making a Valentine’s Day card. This isn’t just any Valentine, though, and it has to be perfect-it’s for Snarlina, his beast friend in the whole wide world.Searching in the dark forest, he finds just the right heart-shaped leaves. He collects some bog slime and squirts everything he wants to say in bold, gooey letters. Groggle’s creation looks horribly good. But there’s just one problem-gobble, crunch, crunch, slurp! He has a monster appetite!Groggle tries again, this time writing poem after poem to make sure he has some extras just in case. He picks skunk flowers, carefully ties on snake bows, and sprinkles shiny beetle glitter. He decorates each card with care. But . . . gobble, crunch, crunch, slurp! 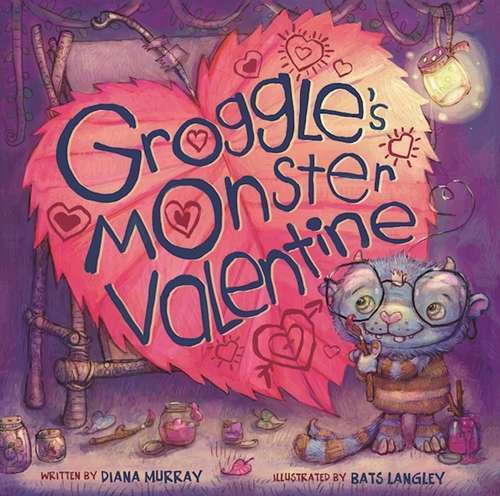 Groggle’s monster impulses foil his efforts and he’s run out of time.Will Groggle ever be able to give his toothsome, stomping, monstrous friend Snarlina a Valentine? Find out in this monster of a tale.Sky Pony Press, with our Good Books, Racehorse and Arcade imprints, is proud to publish a broad range of books for young readers-picture books for small children, chapter books, books for middle grade readers, and novels for young adults. Our list includes bestsellers for children who love to play Minecraft; stories told with LEGO bricks; books that teach lessons about tolerance, patience, and the environment, and much more. While not every title we publish becomes a New York Times bestseller or a national bestseller, we are committed to books on subjects that are sometimes overlooked and to authors whose work might not otherwise find a home.